Update: Click here to check out my review. Produced by Eminem and if anyone is familiar with battle rap culture then you will recognize a lot of familiar faces throughout the trailer. The host of the fictional Killafornia battle league does a great job parodying the intro style of Lush-One, who has hosted a plethora of battles, for the now defunct GrindTime battle league, in a comical way. The Korean rapper Dumbfoundead* makes his long awaited big screen debut as one of Adam’s opponents but who knows, “any minute now they may let an Asian brother get a lead role”. Other battlers include Hollow Da Don (Swear to God), Dizaster, Arsonal, Loaded Lux (Get this work! ), Conceited, Poison Pen, and King of the Dot founder and host Organik. Long time MadTV cast member Debra Wilson and 1980s star Anthony Michael Hall will also appear in the film. 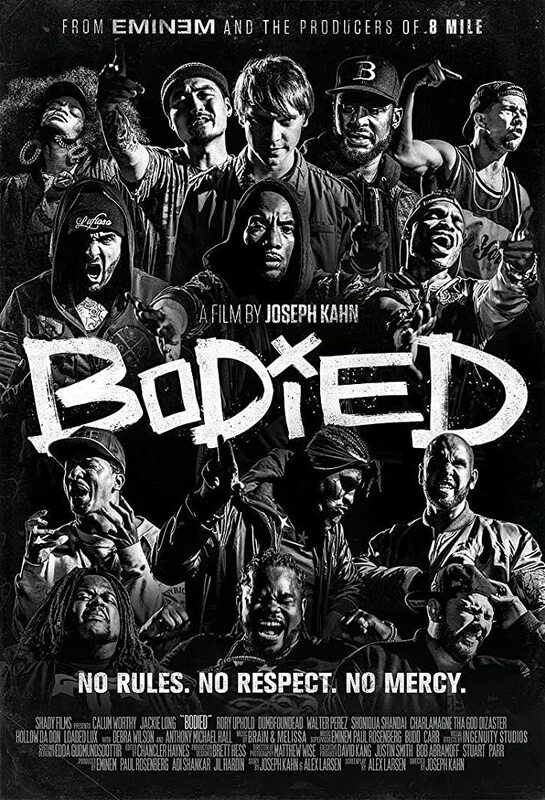 A film based on battle rap that’s written by a battler rapper with an ensemble cast of battle rap legends, on paper, Bodied is shaping up to be a box office success. If it does what 8 Mile did for battle rap culture over a decade ago then this film will help inspire the next generation of battle rap while making a social statement by examining our freedom of speech. *Links to a personal favorite battle or moment.